American composer Eric Whitacre has made several pieces using Youtube to invite participants to sing his works. This TED talk demonstrates how he can also achieve this with a live audience and remote singers. We want to find 20 animators to make this video with. Each animator will be able to take ownership over their own segment, working in their own styles and mediums and with their own character and background designs. A selected few will also have a brief appearance at the end to tie all the characters into the same scene when they receive the text. We have created a sketch for the length of the video with the position of the character on the screen including a 3D plane so you can see what the camera is doing. This way we can connect the animations together. Also you'll see below each clip we've chosen a colour palette and given some direction for the mood we'd like to have in that section." "Reluctant as I am to add to the mountain of interpretations of Somebody That I Used To Know seemingly taking over their own area of the internet, I couldn't resist the massive remixability that such a large, varied yet connected bundle of source material offered. Thankyou to everyone who has responded to Somebody That I Used To Know via YouTube. It's truly amazing! All audio and video in Somebodies is from the YouTube user videos featured, each of them a cover or parody of Somebody That I Used To Know. No extra sounds were added to the mix, but I used some EQ, filtering, pitch–shifting and time–stretching to make the music. I avoided using any existing remixes of the song, or any covers from tv talent shows. As comprehensive and extensive as I tried to be with my downloading of source videos, I know there are many clips that I missed. I used Ableton Live for audio stretching, pitch–shifting and the initial video editing, and Adobe's After Effects to put the final video together. Big thanks to Travis Banko for assistance with downloading source videos, and to James Bryans for After Effects tutelage. Thankyou to Barry for being Barry, and guiding us all. Thanks to you for listening. 1). Remixed version by Wally (13:45, 04 August 2012) "Gotye – Somebodies: A YouTube Orchestra", published on 12 Aug 2012 by gotyemusic. 2). Original version by Wally: "Gotye – Somebody That I Used To Know (feat. Kimbra)", uploaded by gotyemusic on 5 Jul 2011. "What you are about to see is a mix of unrelated YouTube videos/clips edited together to create ThruYou. In other words – what you see is what you hear. Check out the credits for each video – you might find yourself.."
1). Ophir Kutiel (Kutiman), ThruYOU Project, "Kutiman–Thru–you – 01 – Mother of All Funk Chords", uploaded on 7 Mar 2009. 2). 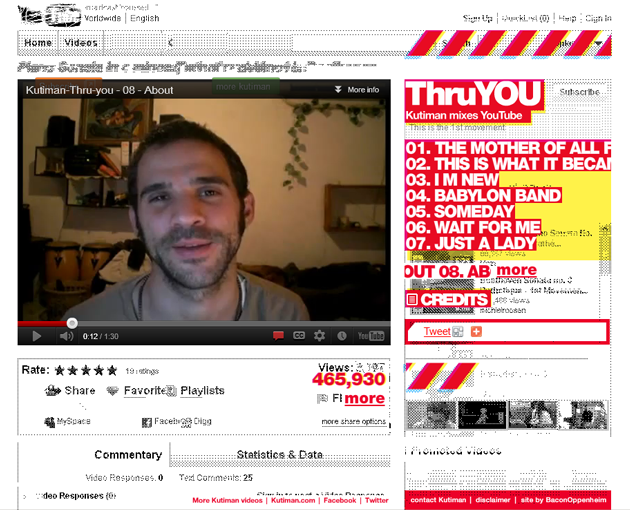 Ophir Kutiel (Kutiman), ThruYOU Project, "Kutiman–Thru–you – 08 – About ", uploaded by kutiman on 7 Mar 2009. 3). website design by Baconoppenheim [http://www.bnop.co/projects/thru–you/], 2009.